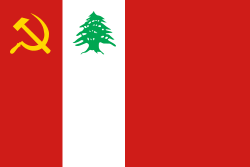 The 1958 Lebanon crisis was a Lebanese political crisis caused by political and religious tensions in the country that included a U.S. military intervention. The intervention lasted around three months until President Camille Chamoun, who had requested the assistance, completed his term as president of Lebanon. American and Lebanese government forces successfully occupied the port and international airport of Beirut. With the crisis over, the United States withdrew. 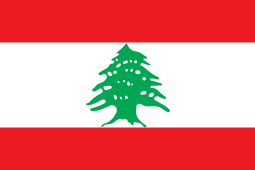 In July 1958, Lebanon was threatened by a civil war between Maronite Christians and Muslims. Tensions with Egypt had escalated earlier in 1956 when pro-western Christian President Camille Chamoun did not break diplomatic relations with the Western powers that attacked Egypt during the Suez Crisis, angering Egyptian President Gamal Abdel Nasser. These tensions were further increased when Chamoun showed closeness to the Baghdad Pact. Nasser felt that the pro-western Baghdad Pact posed a threat to Arab nationalism. 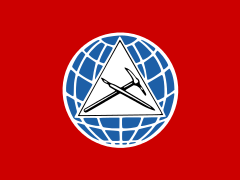 As a response, Egypt and Syria united into the United Arab Republic (UAR). Lebanese Sunni Prime Minister Rashid Karami supported Nasser in 1956 and 1958. Karami formed a national reconciliation government after the 1958 crisis ended. U.S. President Eisenhower responded by authorizing Operation Blue Bat on July 15, 1958. This was the first application of the Eisenhower Doctrine under which the U.S. announced that it would intervene to protect regimes it considered threatened by international communism. The goal of the operation was to bolster the pro-Western Lebanese government of President Camille Chamoun against internal opposition and threats from Syria and Egypt. The plan was to occupy and secure the Beirut International Airport, a few miles south of the city, then to secure the port of Beirut and approaches to the city. The chain of command for Operation Blue Bat was as follows: the Eisenhower administration at the strategic level; Specified Command, Middle East (SPECCOMME, a 'double-hat' for Commander in Chief, U.S. Naval Forces, Eastern Atlantic and Mediterranean) at the operational level; the Sixth Fleet, with aircraft carriers USS Saratoga, USS Essex, and USS Wasp, cruisers USS Des Moines and USS Boston, and two squadrons of destroyers. At the end of June Essex and Boston were anchored at Piraeus, Greece, while Des Moines, from which Vice Admiral Charles R. Brown was flying his flag, was at Villefranche-sur-Mer. Land forces included the 2nd Provisional Marine Force (Task Force 62) and the Army Task Force 201 at the tactical level. Each of these three components influenced Operations Plan 215-58 and its execution. The operation involved approximately 14,000 men, including 8,509 United States Army personnel, a contingent from the 1st Airborne Battle Group, 187th Infantry from the 24th Infantry Division (based in West Germany) and 5,670 officers and men of the United States Marine Corps (the 2nd Provisional Marine Force, of Battalion Landing Teams 1/8 and 2/2).The 2nd Battalion 8th Marines arrived on July 16 after a 54-hour airlift from Cherry Point, North Carolina  They were supported by a fleet of 70 ships and 40,000 sailors. On July 16, 1958, Admiral James L. Holloway, Jr., CINCNELM and CINCSPECCOMME, flew in from London to Beirut airport and boarded USS Taconic, from which he commanded the remainder of the operation. The U.S. withdrew its forces on October 25, 1958. ↑ For more on the naval and Marine Corps forces involved, see Thomas A. Bryson, Tars, Turks, and Tankers: The Role of the United States Navy in the Middle East, Scarecrow Press, Inc., Metuchen, NJ, and London, 1980, 126–140. ↑ "Amphibious Warfare History". GlobalSecurity.org. Retrieved 2011-03-22. Shulimson, Jack (1966). 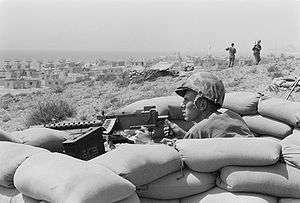 Marines in Lebanon, 1958 (PDF). United States Marine Corps Historical Division. Archived (PDF) from the original on 17 October 2008. Retrieved 14 October 2008.